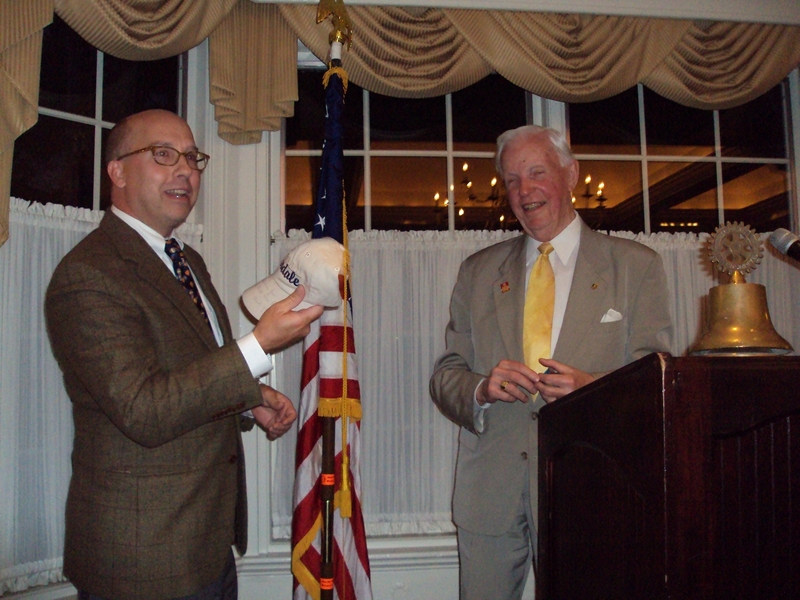 Last Tuesday, I had the pleasure of dining with Wilf Wilkinson (here I am giving him a Lansdale cap). Mr. Wilkinson was the President of Rotary International from 2007-2008. For the non-Rotarian, his name might elicit a “Who’s he?” and for the average Rotarian like me, it might elicit a feigned interest of an “Oh, really?” However, upon talking to this distinguished and spry 82 year old Canadian, I was thoroughly awestruck by his energy, his travels and his meetings with Bill Gates (twice) who gave Rotary $255 million dollars to fight polio, Pervez Musharraf, then President of Pakistan where there are still a number of polio cases per year, both Pope John Paul II and Benedict and no less than 30 heads of States and Nations throughout the world– all in the name of service to others. And without a salary. In fact, all Rotarians are volunteers from the newly inducted all the way to the President of Rotary International. 1.2 million members worldwide giving their money and time for worthy causes. Grass roots, one Rotarian, one dollar at a time making a difference both locally and globally. The Arts In Lansdale. Jazz at Round Guys Brewery. I have written much about the arts in Lansdale– mostly critical of tax payer dollars spent on the arts center. Here’s something a bit more positive about the arts (and it doesn’t cost the tax payer a cent unless of course, he or she buys a beer): Round Guys Brewery has fantastic jazz every Wednesday night courtesy of the Mike Mahomet Jazz Company. Having worked in a jazz bar (The Saloon on U Street) in Washington after college, the caliber of Mike Mahomet’s Jazz Company is first rate. 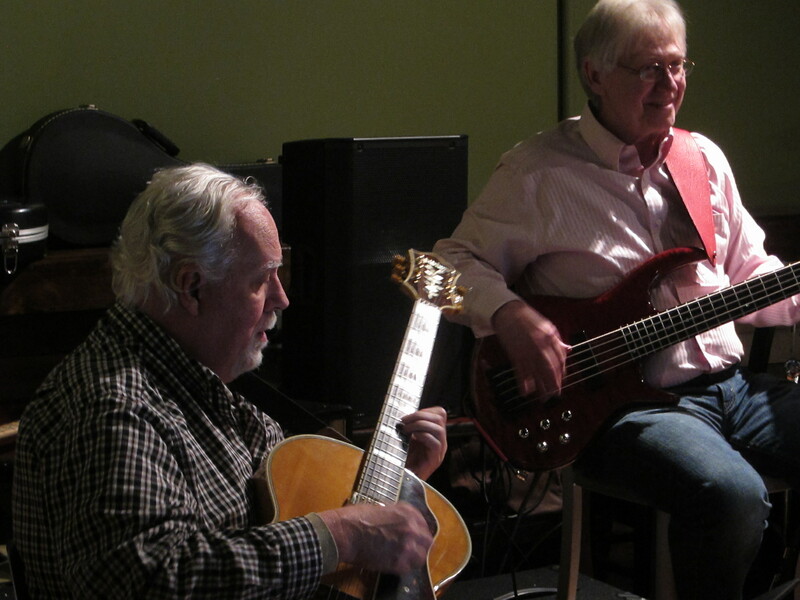 Comprised of seasoned jazz veterans, such those below in the photos, Lansdale is very lucky to have this art form. 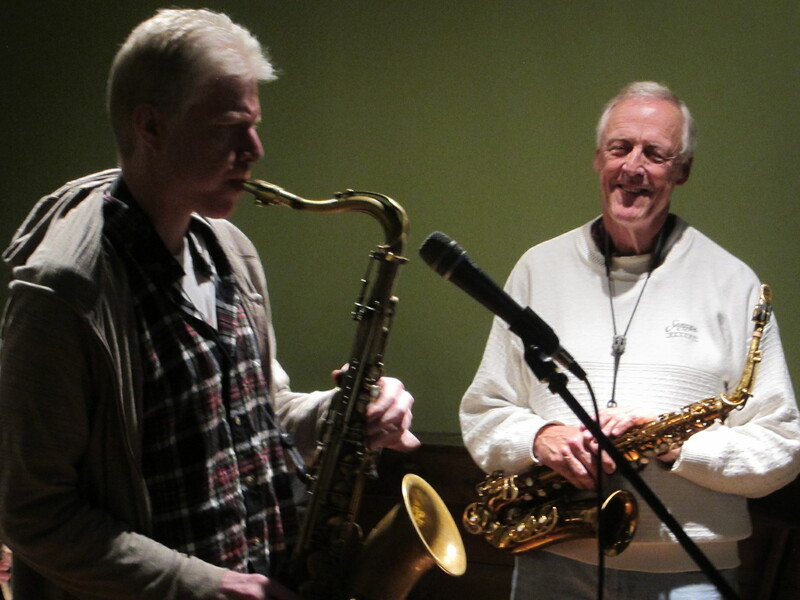 With the silky smooth melodies of 1920’s jazz tunes, Mike and his jazz cohorts play some of the best jazz standards from one of America’s finest art forms. And this all takes place in Lansdale at Round Guys Brewery on Wood Street.